Presenting “Music from the Silk Road"
The Fred Fox School of Music (FFSOM) and the Confucius Institute at the University of Arizona (CIUA) are jointly presenting a special Chinese concert, “Music from the Silk Road,” featuring faculty members of China’s Wuhan Conservatory of Music, at Crowder Hall of Fred Fox School of Music on Saturday, March 24, 2018 at 7:30pm. The concert admission is free and there will be a reception immediately following the concert for the audience to meet the musicians. Guest musicians Tan Jun (sheng), Zhou Hong (pipa), Xie Lili (yangqin), Chu Jun (erhu), Liu Wenjia (guzheng), Zhang Yingying (dizi), Hua Hui (ruan) and Yao Kexin (erhu) will master their instruments for a variety program of Chinese music from the traditional to modern with Eastern-Western fusion elements. It promises to be a beautiful and unique concert from the “Silk Road,” and one not to be missed! 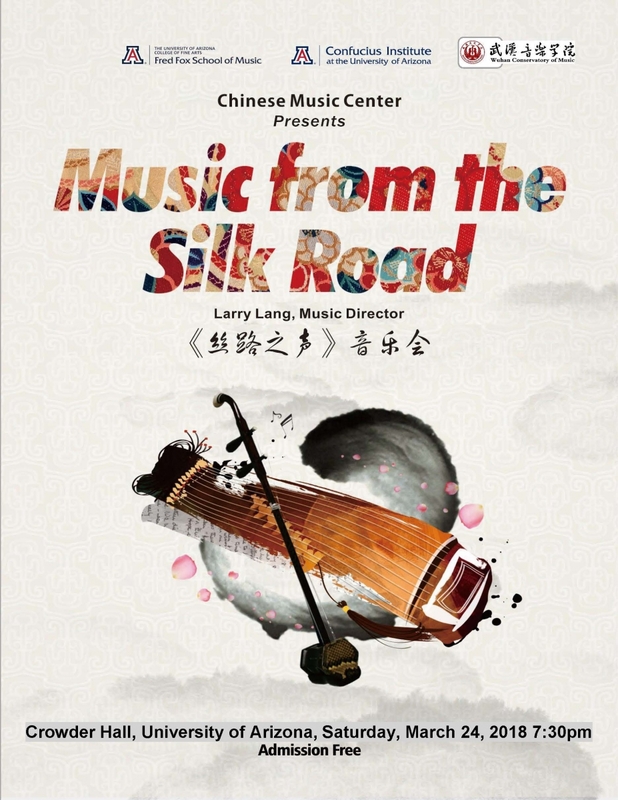 “Music from the Silk Road” Concert is an annual concert series presented by the Chinese Music Center. With the influence of Yoyo Ma’s “Silk Road Project”, the concert series aims to share traditional Chinese music and culture with the UA and local community, bridging differences with the aim of collaboration and harmony.